Tributes have been pouring in for one of East Africa’s most popular musicians, Mowzey Radio, who has died aged 33 after a reported bar brawl. Radio, real name Moses Ssekibogo, died just hours after Uganda’s President Yoweri Museveni donated $8,300 (£5,800) towards his medical bills. He was being treated in hospital for head injuries he sustained in the alleged brawl 10 days ago. Five people have been arrested in connection with the incident so far. According to Uganda’s Daily Monitor newspaper, the singer was allegedly beaten into a coma at a popular hang out spot in Entebbe town, south of the capital Kampala. He had been in hospital ever since, although his management had stressed his condition was improving. 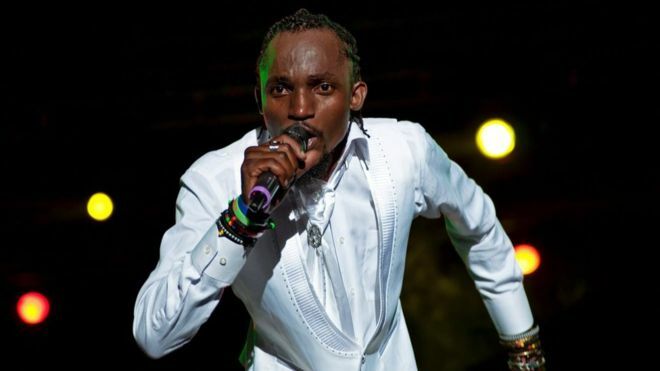 However, at 06:00 local time (03:00 GMT) on Thursday, the singer, who made up one half of duo Radio & Weasel, lost his fight for life. The King ?Is Gone ??? Within hours of his death, the announcement had thousands of responses from people paying their respects to the musician. President Museveni was among those to pay tribute to the singer, who was among the artists who contributed to a song in support of the politician during the 2016 elections. Photos also show a large group of people gathering at the hospital in Kampala where he died. His funeral is due to take place on Saturday.